If you’re a mom or dad and need some help taking care of your children, one of the most popular solutions is to hire a nanny. Whether you need someone to take your kids to school in the morning and pick them up in the afternoon, cook their meals, help them with their homework or get them ready for bed a night, a nanny can fill in for you when you need to be away from the family home. A good employer-nanny relationship is definitely possible, and you can increase the odds of a productive relationship by following a few ground rules. Don’t assume that your nanny is a mind reader. If you hire someone to serve as a nanny but also want them to occasionally do a bit of housework, you need to communicate this. Better yet, spell out what you expect in writing so that there is a hard copy that your nanny can refer to. 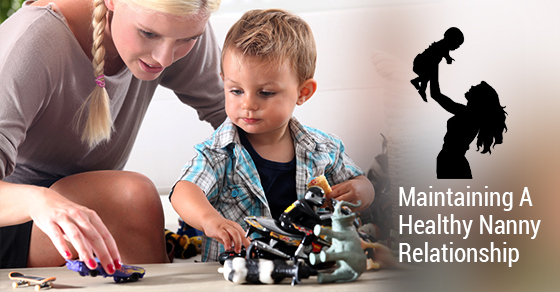 Be sure not to overburden your nanny with too many extra things since you want them to concentrate on your child. If there’s a big issue that’s really bugging you, be sure to discuss the matter with your nanny. Whether you’re not happy with the time they’re putting the kids to bed, you feel they’re using their cell phone too much while on the job, or you’re not comfortable with the language they choose to use, it’s important that these issues be raised. Having a face-to-face discussion will give you and them the opportunity to work out whatever is the matter. You don’t want to tell her about something you believe they are doing wrong a letter or text message as this leaves room for misinterpretation. Face it, your nanny is like a member of the family since they’re there for your child when you can’t be. So take interest in your nanny’s well-being and do all you reasonably can to ensure that all is well with them. The happier they are, the better service they are likely to provide. You shouldn’t expect your nanny to do everything exactly the way you do it. Yes, there are some things you might want written in stone, such rules about bedtime or homework, but you should let the little stuff slide. So if your nanny prefers to hand-wash the dishes rather than use the dishwasher you recently bought, simply be thankful that whichever method they’re using, your dishes are getting cleaned. Remember that your nanny has a life outside of their job. It’s important to your relationship that you respect their time by returning home when you say you will. Since you don’t want them to show up late, it’s only fair that you make it a habit to get home on time. Respect begets respect. Punctuality is also crucial when it comes to her paycheck — don’t forget to pay her on time, or delay reimbursements for any errands she has run for you. Her livelihood depends on you, and by neglecting to pay her appropriately, you will be sowing seeds of uncertainty and possible resentment. Remember: would you like your own salary to be unpredictable and inconsistent? It will take work for you to build a meaningful relationship with your nanny, but following the aforementioned tips will give you some tools to connect with the person who will look after your family.